JENKS, Okla. — Osage language and culture took center stage as part of the pre-inaugural festivities for Oklahoma’s new governor. 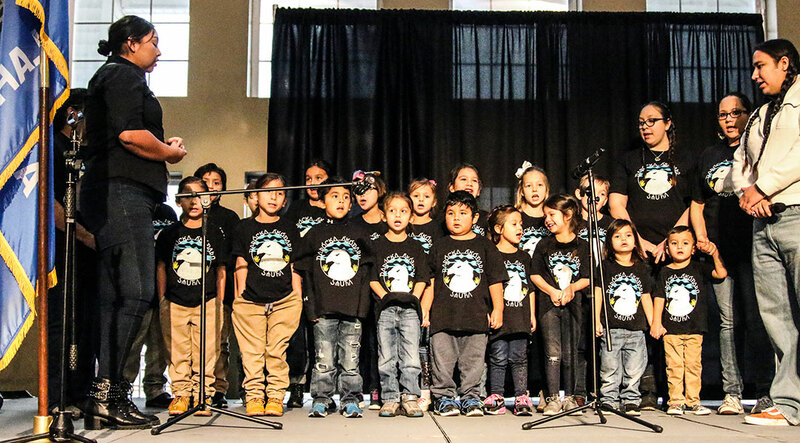 Both the Osage Language Immersion School and youth with Dance Maker Academy were among the groups on the agenda for the Scissortail Children’s Festival on Jan. 12 at the Oklahoma Aquarium. Gov. Kevin Stitt and his family hosted the child-oriented event as part of a weekend’s worth of celebrations leading up to the Jan. 14 swearing-in ceremony for Stitt and other executive branch officials elected in 2018. Ticket proceeds from the event were donated to four Oklahoma-based non-profit organizations that primarily work with families and at-risk youth. Students from Daposka Ahnkodapi recited the Lord’s Prayer in Osage before about 300 people at the Oklahoma Aquarium to officially open the event. Along with his two brothers, Henry Pratt was among the immersion students who prayed on stage. He said he was not intimidated to speak in front of the hundreds of people packed into the Oklahoma Aquarium’s foyer. Like the immersion school students, the youth in the ballet troupe said they did not find out about the invitation until less than a week before the event. However, unlike the immersion students, who had previously learned the Lord’s Prayer, the dancers were performing a selection that was new to them. “We’ve been rehearsing for two hours every day this week,” dancer Penny Adair said.